Make a pumpkin spiced cake shaped like a Halloween candy favorite. Candy corn is always a big favorite when Halloween rolls around. So, this year I decided to use that little treat as inspiration for a big cake. The recipe below starts off as a basic pumpkin spice cake and you can expand from there in a number of different ways. First, you can skip making the candy corn version and just enjoy the cake with its tasty cream cheese frosting. Second, if you’d like to try your hand at using fondant, you can make one candy corn cake and display it on one of your plates or platters. 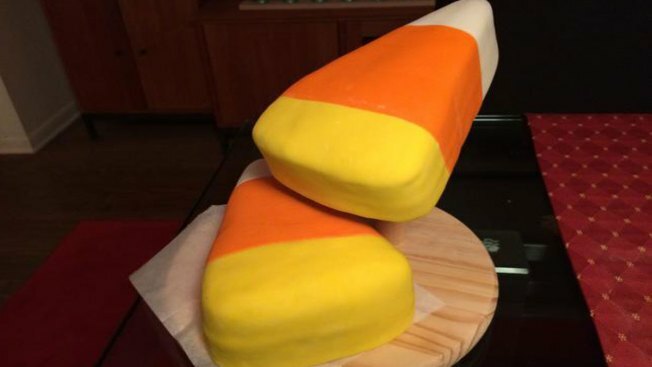 Or, if you like a challenge, you can go all out by making two cakes and the custom display table that floats one giant candy corn over the other one. It is a tasty cake no matter which way to decide to make it. Plus, I’ve also included my pumpkin spice cheesecake recipe which is a variation on my original bourbon mascarpone cheesecake. Preheat oven to 350 degrees F. Thinly coat the bottom and sides of a 9” x 13” cake pan with baking spray and set aside. In a large bowl, combine flour, baking powder, baking soda, cinnamon, nutmeg and salt. Set aside. In a mixing bowl, cream together butter, granulated sugar and brown sugar until smooth. Add pumpkin puree, sour cream, bourbon and vegetable oil. Gradually add in flour and eggs, a little at a time until fully incorporated. Mix at medium high speed for an additional 2 minutes. Pour mixture into prepared pan and bake for 30-35 minutes or until a toothpick inserted into the center of the cake comes out clean. Remove from oven and allow to cool fully. Prepare frosting by blending together the cream cheese and confectioners sugar. Add pumpkin puree, bourbon and cinnamon and mix at medium hight speed until creamy. Set aside. Once cake has cooled, removed it from the pan and cut it in half diagonally. Cut each half into a candy corn shape by laying the template over the cake and cutting around it. Spread a bit of frosting on the cake board and place one layer on it. Add a thin layer of frosting on top of the first layer and place the second one onto it. Frost the entire cake with a thin layer of frosting making it as smooth as possible. Set the cake aside and let the frosting harden a bit. Applying fondant to a cake can be a bit challenging. Here’s a link to a demonstration of the process. To create the fondant layer, divide the fondant into three equal parts. Add the yellow food coloring to one part and mix it in by pulling the fondant like taffy. Repeat with the orange food coloring on a second piece. Liberally dust your work surface with confectioners sugar. Lightly dust your rolling pin as well. Roll out the yellow and white pieces into 5” x 7” rectangles. Roll out the orange into a 3” x 7” rectangle. Place the white and yellow rectangles side-by-side, lengthwise, about 2” apart from each other. Lay the orange piece in the middle of the two, overlapping each by about 1/2”. Using the rolling pin, flatten and expand all three pieces into one large piece that’s about 4” larger than the candy corn template on all sides. Place the rolling pin in the middle of the fondant, perpendicular to the direction of the color bands, and roll half over it. Gently lift the rolling pin and the fondant and place it in the center of the frosted cake with the white portion over the pointed end of the cake. Unroll the half so that the whole cake is covered. Gently work the fondant until it’s smooth on all sides and cut away the excess. If you’d like to create the two candy corn display show in this segment, make a second cake and then build the stand using the pieces shown in the diagram in this PDF. To attach the floating cake to the display, I put velcro on the bottom of the cake and the surface of the support shelf. Preheat oven to 350 degrees F. Finely grind graham crackers in a food processor and then transfer them to a bowl. Melt butter in a small pan or in the microwave and pour over graham crackers. Mix thoroughly and pour into your springform pan. Press the graham crackers about halfway up the side and on the bottom of the pan as uniformly as possible. Bake the crust in the oven for 12 minutes. Remove and set on a wire rack to fully cool, about 30 minutes. In a large bowl, with either a stand mixer or electric mixer, cream together the sugar, cream cheese and mascarpone cheese. Mix thoroughly for about 5 minutes at medium high speed. Add eggs, one at a time, and continue to mix. Add bourbon, vanilla, pumpkin puree, pumpkin spice and salt. Mix for an additional 3 minutes. Pour mixture into your cooled springform pan. Place pan on a baking sheet and bake for 40-50 minutes. The outside edges of the cheesecake will be stiff but the center will still be soft and jiggle a bit. Remove the cheesecake from the oven and increase the oven temperature to 400 degrees F. Let the cheesecake cool for 30 minutes. The cake will settle. Mix together sour cream, bourbon, sugar, pumpkin puree, and vanilla Once cheesecake has cooled, gently spoon the topping over the cake and spread it evenly. Bake for an additional 10 minutes. Remove from the oven and let the cheesecake rest at room temperature four about 45 minutes. Then, place the cheesecake in your refrigerator for 4 hours or longer until it is fully set and chilled.